For ages, industries have used water from lakes, rivers, and the sea to remove heat generated in the production. For environmental reasons it is not allowed to contaminate the recipient by the industrial process liquids. The most common application of recipient water is, therefore, to produce isolated cycle of industrial cooling water via heat exchager between recipient water and industrial cooling water. The quality of recipient water varies with external circumstances; season, weather, and surrounding. In order not to clog the heat exchanger with solid particles in the recipient, the water has to be cleaned in order to avoid frequent cleaning of the heat exchanger. 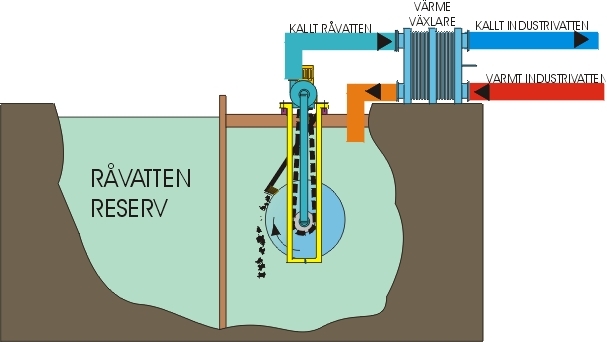 The filter cassette of the DinoFilter (VXPC-A) system is immersed in source of recipient water. As the filtrate pump starts filtration process commences decompressing the filter drum. The filtrate downstream of filter drum is pumped to the heat exchanger cooling the isolated cycle of industrial cooling water. DinoFilter is a self-cleaning cylinder filter with exchangeable permanent filter cloth of stainless steel with arbitrary mesh size. The filtration is carried out on not only through the filter mesh, but mostly through the filter cake (pre-coat layer) with good filtration quality. As the filter layer of filter cake become thicker the decompression in the filter drum increases to a preset point, the filter drum rotates against a stationary brush to brush off the sludge cake from the filter cloth.